Whether you fly into Miami Airport or Fort Lauderdale Airport for your cruise, or arrive by car, you will probably want to spend at least one night in a hotel near Miami cruise port. We have rounded up a selection of top hotels in Miami for cruisers. Best of all, they include a shuttle service to the cruise terminal, either free or at a nominal cost. Disclaimer: Some of the links below will earn us a commission if any purchases are made. Also, prices could change at any time. Delayed flights and bad weather can be a worry if you’re heading to Miami for a cruise. Staying in a hotel before departing on a Caribbean cruise is a smart decision. Once you have safely arrived in Miami, you know that nothing can go wrong to stop you enjoying your exciting cruise. Make you’re ready and get all your cruise accessories from Amazon. If you’re driving to Miami, we recommend choosing a hotel with a park-and-cruise package. Get the best rates for your hotel stay near Miami cruise port including parking and shuttle transfer to the Port of Miami. At the end of your cruise, why not add a couple of nights’ stay at a Miami hotel near the cruise terminal? It’s a great way to extend your cruise vacation for just a couple hundred dollars. It’s sensible to choose a hotel near the Miami cruise terminal to keep your transfer short and easy. Hotels in downtown Miami are just two miles from the cruise terminal. A little further away you’ll find hotels with cruise shuttle in Coral Gables, Miami Shores, or around the Miami Airport in Doral. These are all safe neighborhoods just a 20-minute shuttle ride from Miami Cruise Port. Check out our comprehensive list of 18 affordable Miami hotels that include a shuttle transfer to the cruise port. Prices shown are per night for comparison but prices may vary depending on the date and season. Price starts from $55 per night. Located just north of Miami Airport in Miami Springs, the Runway Inn is a great choice for cruise passengers flying into and out of Miami Airport. Located on NE 1st Street in the heart of downtown Miami, this low-cost budget hotel has air-conditioned rooms and free internet. The room price includes breakfast and a complimentary shuttle service to the cruise port. Book your seat ahead of time with the front desk and be ready in the lobby with your luggage at 10.45am. The transfer to the cruise terminals takes no more than 10 minutes – a great way to start your Caribbean cruise! Price starts from $62 per night. Located on NE 1st Street in downtown Miami, the Leamington Hotel Miami is one of the best value hotels near Miami cruise port. Rooms are small but include Wi-Fi, air-conditioning and continental breakfast. There are plenty of bars, restaurants and shops within walking distance and the Bayfront Park is nearby. This no-frills Miami hotel offers a free shuttle to the cruise port for guests, making it cheap, convenient and easy. Price starts from $86 per night. Close to Miami airport for those arriving by air, the Quality Inn Miami Airport is a no-frills hotel for those looking for a budget hotel near Miami cruise port with free shuttle included in the price. Pre-book the “Stay and Cruise” package which includes a complimentary airport pickup and a shuttle bus to the cruise port for up to two guests. Additional guests will incur a charge of $10 per trip. Price starts from $97 per night. The award-winning Comfort Suites Miami Airport North is five minutes from the airport and offers a free shuttle service to both the airport and the cruise port. It’s ideal for those flying into Miami ready to depart on a cruise from the port of Miami. Notify the desk on arrival to book your seat on the shuttle. The transfer to the cruise port is free but those arriving by cruise and wanting to stay the night at the Comfort Suites will be charged a $10 pickup fee per adult. Price starts from $123 per night. Hampton by Hilton in exclusive Coconut Grove is a comfortable Miami hotel with free cruise shuttle service seven miles from the port. There’s plenty of shopping, dining and nightlife nearby at Cocowalk and Bayside Marketplace and the American Airlines Arena are just minutes away. Spacious rooms include free Wi-Fi and a hot breakfast. Book a “Stay and Cruise” package and get free parking and shuttle to the cruise port included in the price. Price starts from $134 per night. Part of the Marriott group, the Residence Inn Miami Airport has an excellent reputation for its service and standards. It is 10 minutes from the airport and 20 minutes from Miami cruise port. This quality hotel offers a “Miami Cruise Experience” package for two which takes care of everything with room, breakfast, airport shuttle service and free cruise shuttle service included in the price. Rooms are modern and have excellent amenities including kitchenette and Wi-Fi. Upgrade to a studio or suite with king bed and start to enjoy your luxury cruise vacation the moment you arrive in Miami. Price starts from $134 per night. The Courtyard Miami Airport Hotel offers three-star accommodation within easy reach of Miami Airport. Convenient for those arriving by air, the hotel also offers free parking for guests during their stay. Cruisers should enquire about the best rates for the “Extend your Miami Cruise Experience” which includes comfortable accommodation, breakfast and free courtesy shuttle to Miami cruise port. Price starts from $155 per night. Located three miles north of Miami cruise port, Hampton Inn & Suites Midtown Miami is a modern hotel with bay views in the up-and-coming Buena Vista Arts District, close to I-195. Relax and enjoy the outdoor pool, artworks display by local artists, fitness room and multilingual staff. The best deal for cruisers from Miami is the “Stay and Cruise” package which includes a spacious suite with refrigerator and coffee maker, hot breakfast, Wi-Fi and transport one-way by shuttle to Miami cruise port on the morning of your cruise. Price starts from $157 per night. DoubleTree by Hilton Grand Hotel Biscayne Bay is a high-end luxury hotel right on the waterfront. The excellent amenities include a salon and spa, fitness center, ballroom, outdoor pool, business center and four restaurants including the Zagat awarded Waterclub. The cruise port of Miami is just one mile from the hotel and the “Cruise Escape” package includes breakfast and transportation to the cruise port. It’s the perfect way to start and end any cruise vacation in style. Price starts from $184 per night. Miami Airport Marriot is a popular choice which offers a special Park & Cruise package with discount. The hotels have complimentary shuttle service to the cruise port as part of the package. Here are the cheapest hotels near the Miami cruise port which have a fee-based shuttle service. The hotels may also include certain packages you might want to check first. Price Starts from $76 per night. Located two miles from Miami Airport, Holiday Inn Express Miami Airport East is a top choice hotel with a cruise shuttle service just seven miles from the port. It has excellent reviews from past guests. This modern boutique hotel offers standard air-conditioned rooms with Wi-Fi, heated outdoor pool and spa. A buffet breakfast is included in the price. Guests should arrange with reception in advance for a seat on the shuttle to the cruise port and a small fee is charged per person. Price starts from $89 per night. Located near the airport and 20 minutes from the Miami cruise terminals, Doral Inn & Suites is a cozy two-star hotel with pool, fitness center and modern air-conditioned rooms. Enjoy a free hot breakfast before taking your seat on the cruise shuttle bus which transfers guests and their luggage to the cruise port for a small additional fee. Price starts from $151 per night. This hotel is near Miami International Airport and is a great option for cruisers as it is not too far away from the cruise port. Sleep Inn offers a shuttle service from $10 to the port very easily. Price starts from $161 per night. The Crown Plaza Miami Airport is a nice hotel with very good reviews from those heading to the cruise port. The hotel offers a shuttle service for just $10 per person. The good customer service has been mentioned many times for Crown Plaza. Price starts from $112 per night. 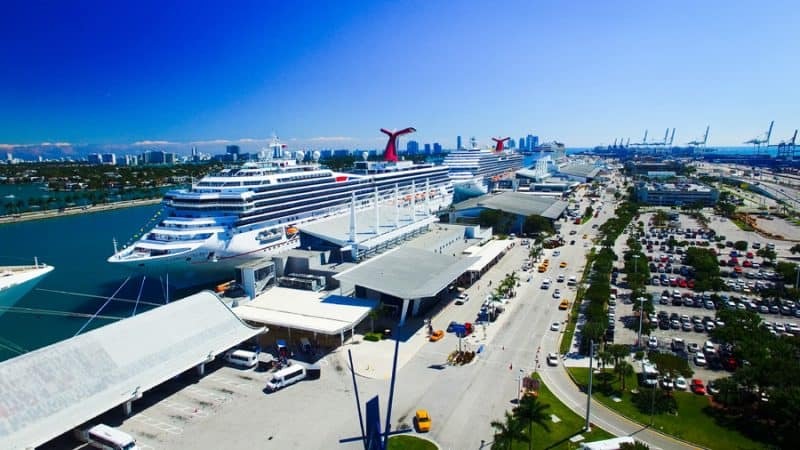 If you want a memorable start to your cruise, the cosmopolitan and trendy YVE Hotel is the best hotel near Miami cruise port to meet your expectations. Located in the heart of downtown Miami, and just two miles from the cruise port, this contemporary hotel includes a sun deck, outdoor pool, restaurant, bar and its own nightclub. The rooms in this boutique hotel include modern eclectic décor and free internet for guests. When it’s time to head for your cruise, Hotel YVE lays on shuttle transport for around $8 per person, but pre-booking is required. Price starts from $127 per night. This stylish Hyatt Place Miami Airport – West Doral is popular as a business hotel as well as being handy for cruisers using Miami Airport. Modern well-appointed rooms are complemented by a pool, gym and fitness center, bar lounge and business center. The shuttle to Miami cruise port is operated by an independent operator in conjunction with the hotel. It costs $12 per person and offers a pick-up from the hotel at 10.30am or 12.30pm on cruise days. Price starts from $129 per night. Book yourself a hotel with complimentary cruise shuttle included in the price with the “Cruise and Stay” package at the Hilton Garden Inn. It includes shuttle service from the hotel to the port of Miami. If you want to include parking for the duration of the cruise, check the savings with a “Park, Stay and Go” package. This includes free parking for the duration of your cruise (up to 15 days), as well as a luxury room and buffet breakfast. With this parking deal, guests are charged $12 per guest each way for the shuttle service to the cruise port. Either way, the hotel offers great savings compared to independent cruise parking and a taxi to the port. Price starts from $134 per night. Less than 10 minutes from Miami cruise port, the Hilton Downtown Miami is one of the city’s premier luxury hotels. Located on Biscayne Blvd, this high-rise luxury hotel has over 520 deluxe rooms and suites, many with scenic views across Biscayne Bay to the iconic Miami Beach skyline beyond. Museums, the Center for Performing Art and Bayfront Park are all within walking distance and guests can enjoy the on-site restaurant, pool, health club and bar. 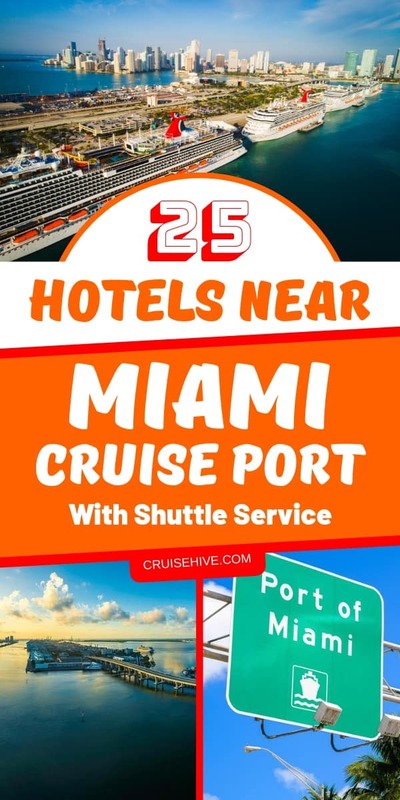 Most importantly, this luxury Miami hotel offers a shuttle service to the port for a nominal fee and has “Park and Cruise” packages at competitive prices. Price starts from $159 per night. The Intercontinental Miami is a luxurious experience located on Chopin Plaza in the heart of downtown Miami. Located near the upscale Mary Brickell Village, it is four miles from the cruise port. This five-star hotel has the ultimate Cruise Package including two welcome drinks at the poolside Bluewater bar, buffet breakfast for two and a beautiful room with upscale amenities. On departure, the hotel gives you $20 for transport to the port so you can travel in comfort in a private taxi, courtesy of the hotel. Price starts from $167 per night. Check out the “Stay and Cruise” package when you book a night at the Hampton Inn Miami Airport South/Blue Lagoon. Located in NW 57th Ave, this stylish hotel is a 20-minute drive from Miami cruise port. It is also just minutes from Miami International Airport for those flying to and from their Miami cruise. It offers many amenities including a business center, gym, complimentary Wi-Fi and free hot breakfast to see you through the morning. It offers a free shuttle service to and from the airport for two guests with a $10 fee for additional riders. The best deal is the all-inclusive “Stay and Cruise” package making this a top choice hotel near Miami cruise port with shuttle service. Price starts from $191 per night. Enjoying views of Downtown Miami and Biscayne Bay, the Holiday Inn Port of Miami/Downtown is one of the closest hotels to the cruise port. Offering a convenient shuttle service to the port for guests for a small fee, the hotel is close to Bayside Park and Bayside Marketplace for shopping, dining and nightlife. Located on Biscayne Blvd, this upscale hotel also has a beautiful pool and restaurant, making it a wonderful place to relax and stay before or after your luxury cruise. Price starts from $259 per night. This hotel is extremely near the Miami cruise port but doesn’t include any specific shuttle service. We thought it was worth including the Hyatt Regency as it’s just two miles away in downtown and transportation can easily be arranged at reception for the next morning. Price starts from $192 per night. Hilton Miami Airport Blue Lagoon is a great choice for cruisers no matter which cruise line terminal you need to get to. You just pay $10 per person with no limit on how much luggage you have. Just mention the ship and the driver will know exactly where to drop you off. Price starts from $267 per night. Another good hotel for getting to the cruise terminal for embarkation day. Homewood Suites has good shots and restaurants nearby and provides a shuttle service for $10 per person. Price starts from $409 per night. This is a stunning hotel not far from Port of Miami. It offers great views with good amenities. Atton Brickell Miami doesn’t offer an actual shuttle service but many cruisers have enjoyed this hotel and transportation can easily be arranged to the port. A taxi will cost around $20.